Adult female western corn rootworm, Diabrotica virgifera, on a corn leaf. Each spring, the western corn rootworm (Diabrotica virgifera) awakens from its winter slumber to wreak havoc on corn crops across the United States. The pest emerges in larval form, hatching from small white eggs deposited beneath the soil and causing significant feeding damage to the grain crop’s roots. The toll on U.S. farmers: an estimated $1-2 billion annually in yield losses and chemical control. On the biological control front, for example, a team of scientists from the Agricultural Research Service and the University of Neuchâtel (UniNE), in Switzerland, is field-testing different formulations to apply beneficial roundworms that prey on the pest. The roundworm, a species of entomopathogenic nematode known as Heterorhabditis bacteriophora, poses no danger to humans, pets, or livestock. But its lethality to rootworms may give corn growers another option for protecting their crops—together with use of insecticides, rotations with nonhost crops like soybean, and Bt corn. Beneficial nematodes that can attack and kill corn rootworm must be mass-produced before distribution. Here, a cadaver of a waxworm larva (right) serves as a host “factory” for nematodes feeding within it. 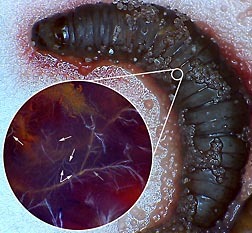 Inset: A microscopic view of the thread-like nematodes (white arrows point to several; the gray arrow points to a nerve of the insect host) inside the cadaver. Delivering beneficial nematodes to the fight isn’t always easy, though. “A standard way to apply the nematodes is to spray them over the fields. This is done because the natural populations are not high enough to control the insects on their own. However, spraying is labor-intensive, water-consuming, and costly,” says Ivan Hiltpold, a visiting scholar from Switzerland who is now working with Bruce Hibbard, an entomologist and rootworm expert in ARS’s Plant Genetics Research Unit in Columbia, Missouri. In an alternative approach, Hiltpold and UniNE professor Ted Turlings, along with Hibbard and ARS entomologist Wade French, are experimenting with ways to encapsulate H. bacteriophora within an algal-based sugar polymer. The test capsules, which were soft enough for the nematodes to escape from, were deposited by hand beneath the soil surface. During 2011 field trials conducted in corn fields in Columbia, “we used half a liter of water to form the capsules, but about 2,000 liters with spraying,” says Hiltpold. He is investigating the technology in parallel with a 2-year assignment with Hibbard. A report describing the team’s findings appeared online in May 2012 and later in print in the journal Plant and Soil. Although the encapsulated nematodes (about 2,700 per capsule) reduced rootworm damage to corn roots better than spray formulations, refinements to the capsules proved necessary, including determining optimal thickness of capsule walls and storage conditions. During laboratory experiments, for example, twice as many nematodes escaped capsules stored at room temperature (around 77°F) than at 45°F. “We’re now working on a new, harder polymer shell that will dissolve in soil over time, releasing the nematodes,” says Hiltpold. Encapsulated within an algal-based sugar polymer capsule are thousands of beneficial Heterorhabditis bacteriophora nematodes. After the capsule is deposited into the soil near corn plants, it’s soft enough for nematodes to escape from and requires substantially less water to apply than spray applications of nematodes. The team is also examining whether coating capsules with rootworm attractants and feeding stimulants will increase the pest’s likelihood of encountering the nematodes. “That worked pretty well in the lab, but hasn’t proved true in the field yet,” says Hiltpold. Fortunately, the nematodes are adept hunters. Hiltpold’s and Turlings’s studies of Heterorhabditis show it’s something of a “subterranean bloodhound” when it comes to tracking chemical cues, or scents, that diffuse through soil, particularly the volatile compound (E)-beta-caryophyllene, or EßC. 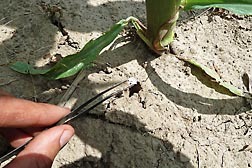 When chewed on, corn plant roots release the compound, which attracts hungry nematodes in the surrounding soils. Upon locating the offending rootworm, the nematodes wriggle inside the rootworm and release symbiotic bacteria, which multiply and then kill the insect by poisoning its blood. The nematodes then feed on the bacteria and mate, spawning new generations that eventually burst out of the dead insect in search of new hosts—starting the cycle over again and sparing the plant further harm. Such “tritrophic interactions” (in which one organism benefits from another’s interference of a third organism) have been a key focus of Hiltpold’s studies at UniNE’s Institute of Biology. 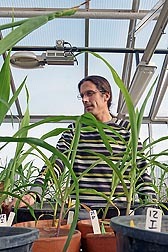 Visiting scientist Ivan Hiltpold examines corn plants for damage from western corn rootworm in a greenhouse at ARS’s Plant Genetics Research Unit in Columbia, Missouri. Hiltpold notes that European corn varieties normally produce the EßC root signal. But the trait is missing in most U.S. varieties—save for an experimental strain that has been modified with an EßC-producing gene introduced from oregano. In earlier lab and field trials, the ARS-UniNE team demonstrated the success of the approach in restoring the corn strain’s nematode-signaling capacity. 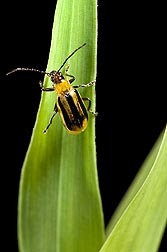 Whether by conventional breeding or biotechnological means, fine-tuning corn’s ability to release a distress signal could ultimately complement the use of encapsulated nematodes—broadening the arsenal of weapons brought to bear on the rootworm and diminishing its costly damage. Backed by genetics-driven studies of the pest’s populations, movements, and ability to develop resistance to Bt corn, researchers could be closer to shutting down the pest’s avenues of attack and flight, as well.—By Jan Suszkiw, Agricultural Research Service Information Staff. This research is part of Crop Protection and Quarantine (#304) and Plant Genetic Resources, Genomics, and Genetic Improvement (#301), two ARS national programs described at www.nps.ars.usda.gov. Bruce Hibbard is in the USDA-ARS Plant Genetics Research Unit, Curtis Hall, University of Missouri, Columbia, MO 65211; (573) 882-6281. "Nematode-Filled Capsules Tested Against Corn Rootworms" was published in the May/June 2013 issue of Agricultural Research magazine.